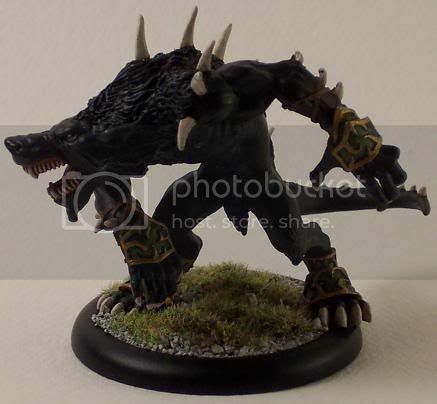 Warpwolves are one of the most versatile Warbeasts in all of Hordes. At first glance they appear to be one of the weaker Heavy Warbeasts, but they perform extremely well in-game. They have the ability to enhance their strength, armour, or movement at will. They can brush aside otherwise debilitating damage through their regeneration and reactive warping abilities. Their chain attack cause automatic damage to each branch on a Beast's life spiral and causes knock-down. 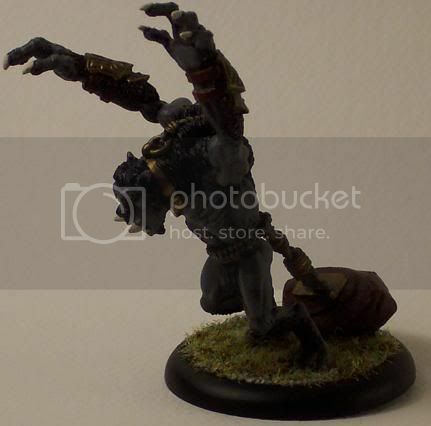 Any Circle Orboros Warpack can benefit from the inclusion of a Warpwolf (or 2). 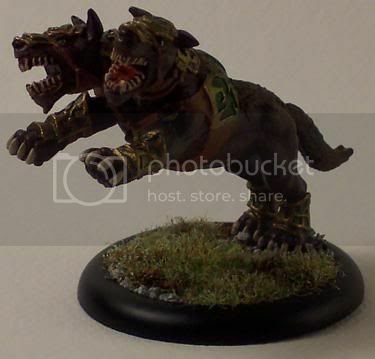 Argus are the faithful two-headed pups of the Circle Orboros. The are fast and resilient beasts. Their heads can attack independently in melee, or can combine to hit with the same power as a Warpwolf. Their Doppler Bark ranged attack can paralyze an enemy model, forcing it to forfeit it's movement or action the next turn. This ability combines perfectly with the Warpwolf's chain attack. 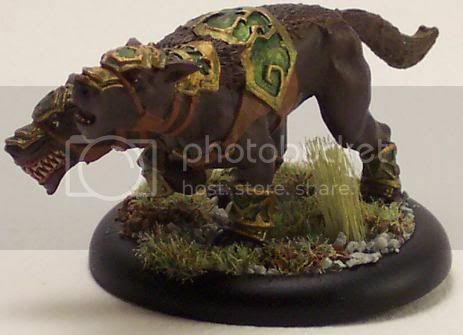 If a Warpwolf hits with it's initial attacks and its chain attack, yet the enemy model survives, an Argus can follow up with it's Doppler Bark and stack Paralysis with Knock Down, thereby virtually removing that model from the game for that next turn. The Gorax is a great support Warbeast. It cost only 3 points more than an Argus but it has 4 Fury and a superb Animus, Primal. Primal grants +2 Strength and MAT to a friendly Warbeast. It also causes that Warbeast to automatically Frenzy during the next turn. This basically turns the targeted Warbeast into a guided Frenzy missile. Cast this on a Warpwolf and send it into the heart of the enemy to cause as much damage as possible. Unfortunately, I've never had a Primaled Warbeast actually survive long enough to Frenzy as my opponent always makes it a top priority to destroy the beast. Woldwardens are the Tank of Hordes. They hit extremely hard and have a Slam-effect chain attack, they have more health than just about anything else, they have an excellent defensive Animus, and they have the ability to cast one of their Warlock's offensive spells for free. It's this last ability that really shines most of the time. A trio of Woldwardens matched with Krueger can cast three sets of Forked Lightning, hitting 6-12 enemy models, for free. This decimates infantry. 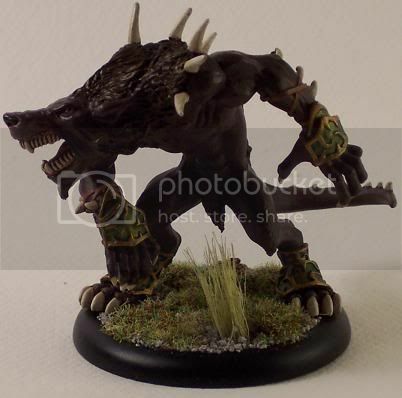 Combine that with the Woldwarden's pure melee power and you have an excellent Warbeast that is hard to kill and that is a serious threat to just about anything that your opponent can field. 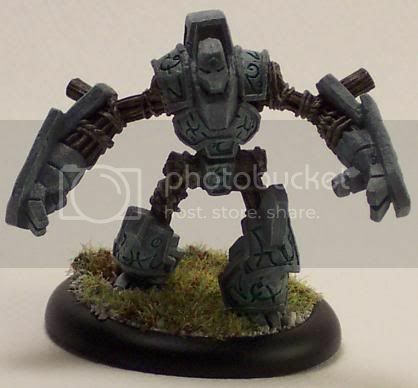 Woldwatchers are the smaller versions of the Woldwarden. They act as scouts and watchposts for the Circle Orboros. Woldwatchers have a set of abilities that combine very well together. Advance Deploy allows the Watcher to be placed almost to the middle of the battlefield before the game begins; Stone Form boosts the Watcher's already high Armour and prevents it from being thrown or slammed by the enemy, the Watcher's Vigilance Animus lets the Watcher make a free move and attack if an enemy model gets too close, finally Fertilizer makes anything killed by the Watcher's Claw or Ranged attacks turn into a 3" Forest for a turn. Combined, you have a Watcher that is very resilient and that can really control a portion of the battlefield on it's own by it's simple presence and it's ability to make additional terrain. Hey! Nice Miniatures! 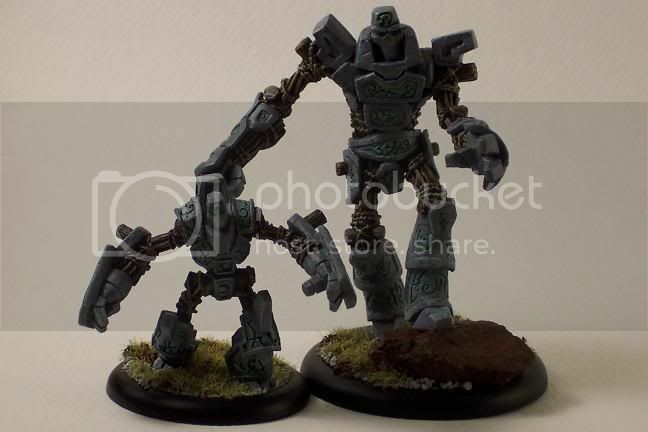 Could you perhaps tell me how tall (in cm or inches) this Worldwarden "Golem" miniature is (the bigger one)?